FLEAS Service for Fleas…We can help! Talk to the Local Experts! 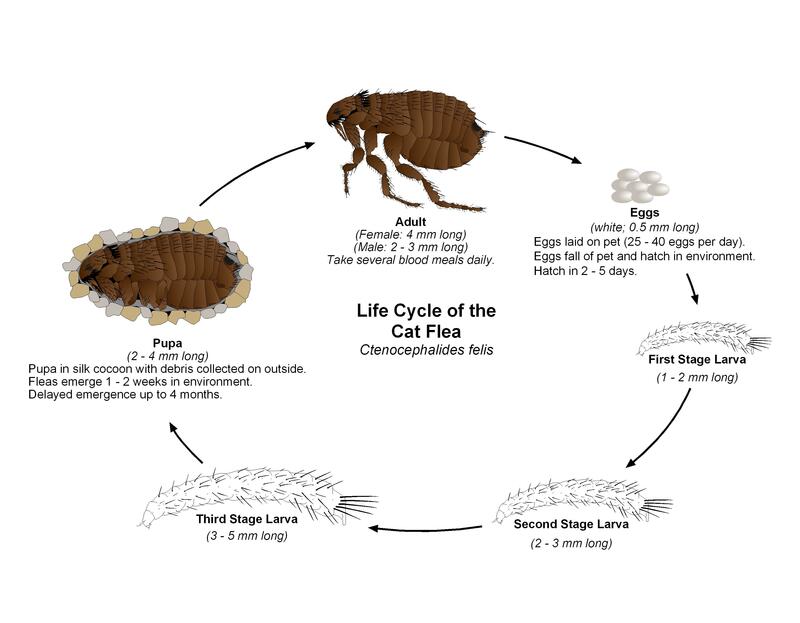 Fleas have four stages of development: egg, larval, pupal and adult. It takes from 2 weeks to several months to go from egg to adult depending on the species, temperature, humidity and food availability. After each blood meal, females lay 4 to 8 smooth, round, light-coloured, sticky eggs. She can lay 25 eggs per day, and roughly 800 in her life. Eggs hatch into very small, hairy, wormlike larvae that are whitish with brownish heads. The larvae are from 1.5 mm to 5 mm long. They feed on organic debris, their own cast skins and dried blood in adult flea excrement. Larvae can survive up to 200 days even in unfavourable conditions and travel up to 30 cm per minute. They will spin silken cocoons covered with particles of dust, fibres, sand and organic debris and later emerge as an adult flea. Adult fleas may remain in the cocoon for several months until favourable conditions arise, such as a rise in temperature and carbon dioxide levels. Vibrations created by the presence of humans and pets will also stimulate their emergence and activity. To break the flea cycle successfully, the home and pet must be treated. The manner in which these treatments are done can greatly influence the results. The homeowner must rely on a combination of sanitation and chemical treatments. Vacuum carpets and cushioned furniture daily. Clean around cracks and crevices on floors and along baseboards and basement. Steam cleaning carpets will kill fleas in all stages with the hot steam and soap. Inspect pets regularly, especially during peak flea season. Look for black particles the size of milled pepper on the skin. Use a flea control product once an infestation has occurred. Before using a product, consult with a veterinarian to determine the best treatment for your pet and to limit the amount and combination of chemical exposures. Wash all pet bedding and family bedding in hot, soapy water every 2 to 3 weeks. Lift blankets by all four corners to avoid scattering the eggs and larvae. If an infestation is severe, replace old pet bedding. If you have a flea infestation…Talk to the Experts at Muskoka pest Control…We Can Help!